This photo from this issue of The Coast magazine remains a mystery. 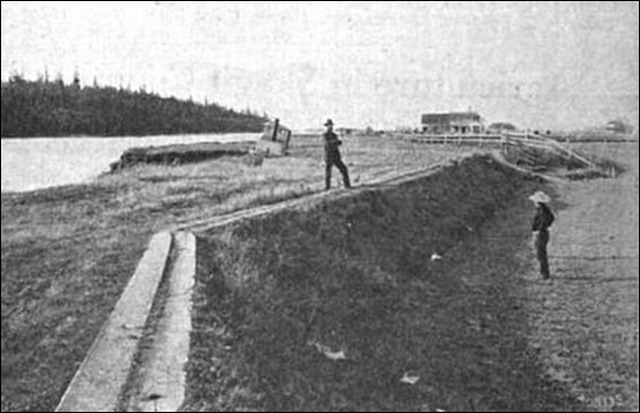 The caption reads: "First House built on the Skagit river." It was credited to Ralph Hartson, 1906. We know from the accompanying Issue 56 article on William Sartwell that he built the first permanent settler structure, a cabin, in 1863, north of the later town of Conway. Is this what Hartson meant? This seems to be a more substantial log house. Also, we know from the 1913 obituary of Mrs. Mathilda (Magnus) Anderson that the 1863 cabin had collapsed down that summer. We hope that a reader can help us answer the question and especially we hope someone can identify the people in the photo. It is not the intention of the writer to take into consideration the early history of every part of Skagit County, but rather that part of the county known as "the Skagit Valley." This part comprises the heart of Skagit County, and is the largest and most fertile valley in Western Washington. It is scarcely possible to conceive the great changes that have taken place from the time the first settler located his humble cabin in the heart of a great jungle, until the present time. Then were great forests of alder, spruce and fir trees. Now there are wide stretches of rich alluvial lands, on which are found the beautiful mansions of wealthy farmers. Many of these farmers are the original first settlers, while others are their successors, and are reaping the harvest sown by the old timers of forty years ago. The writer well remembers that at this time not even a blind trail existed over which it was possible to travel. All transportation was by canoes and boats. 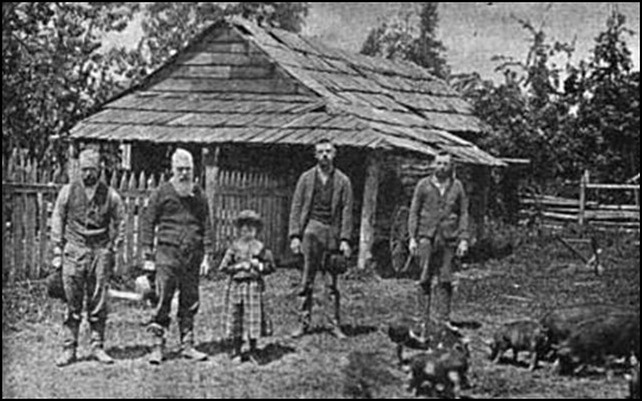 The first of the early settlers was careful to have his cabin located on the bank of the river in order to have some means to reach the outside world and renew his supply of provisions when they became exhausted. Imagine if you please three men gathered together on the bank of the river near where the town of Conway is located. A few trees have been cut down, but not enough to let in the sunshine. These men are earnestly discussing some important question. The outside world is just recovering from the effects of the Civil War and it might be this important subject that is engrossing their minds. But no. It is something of far more importance to them. A long slim alder tree has been chopped down, and one of them takes an ax and cuts it into lengths of twelve and fourteen feet. The other two proceed to notch the ends and lay them up, forming a pen. This is the beginning of the first cabin in the Skagit Valley, built of logs and covered with cedar shakes. The doorway was so low that one had to duck his head in order to enter. This, the first house in the Skagit Valley, was built by W.H. Sartwell on the land now owned by Magnus Anderson, five miles below Mt. Vernon, in the year 1863. The men who assisted Mr. Sartwell were O. [Orrin] Kincaid and a man named Todd, whose cabins were built by the trio a few days later. Following close after the first three settlers came were John Wilson, John Shepherd, William Johnson and William Alexander. J.V. Abbott located on May 5, 1865, shortly followed by Dave Anderson, who first located the land on which the town of Skagit [City] now stands, shortly afterwards selling his right to Edward McAlpine. In those early days settlers did not come very rapidly, and the advent of a new arrival was hailed with joy, the scattered pioneers gathering to wish him good luck, and assist in building his cabin. In the period of a few years the following settlers had located: On the south, Joe Lisk, William Kayton, George Wilson, John Wilbur, Lemuel Sweet, A.G. Kelley, R.L. Kelly, John Wilson and Joe Wilson. On the north fork, John Ganey, William Hayes, William Oughton, Joe Maddox, Wm. Drown, H.A. Wright, Peter [Van] Kuyl and Magnus Anderson. These comprise the earliest of the early settlers, and all were unmarried at the time of their location. The first man with a family who made a settlement was Thomas R. Jones, followed shortly after by [Samuel] S. Tingley, both of whom located on the north fork. To the wife of Mr. Tingley was born the first white child, Oliver C. Tingley, born June 6, 1870. It is only telling an old story to state the hardships endured by these early settlers. The country being densely timbered, made it worse than in prairie sections of more favored localities. There the land was all ready for the plow; here it had to be cleared at enormous labor, which was only partially atoned for by the large crops produced. Sartwell, Kincaid and Todd established a the cabin on the former's cabin a trading post, exchanging goods and merchandise with the Indians for furs. They found great difficulty in purchasing their stock of goods, as the dealers at Seattle and Olympia being desirous of securing the Indian trade, refused to let them have goods at less than retail prices, which they were compelled to pay, as they were not in a position to order goods from San Francisco; neither were they certain that the mill companies would consent to bring them in their ships if they were to endeavor to open up a trade with the distant city. Shortly after Mr. Kincaid went to Victoria and from there to California. In the meantime Todd died, leaving Sartwell all alone. Of the settlers of the first period only Magnus Anderson and H.A. Wright are still alive, all the others having passed to the great beyond. Second era The second era of the settlement of the Skagit Valley may be said to date from the arrival of men with families. It was during 1870-71 that the valley received its greatest influx of settlers with families. It was during these years that settlements were made by George Gage, D.E. Kimble, Jasper Gates, A. [Augustus] Hartson, S.C. Washburn, [Joseph] F. Dwelley, Wm. Brice, Charles Washburn, Isaac Lanning, — Britt, Thomas Bozarth, L.M. Ford and John Gates. This earth-packed seawall was typical of those constructed along the forks of the river and the sloughs. 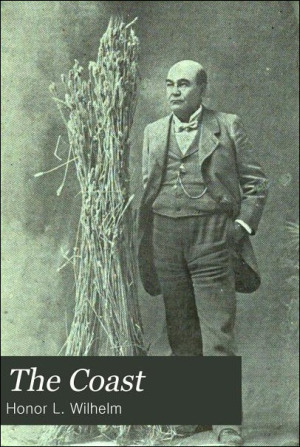 Featured in December 1908 issue of The Coast magazine. From this time on the settlement was rapid, extending only up the river as far as the jam [see: ], at a point where the city of Mt. Vernon now stands. Owing to the lack of roads or trails it was considered impracticable to locate above the jam; new arrivals preferring to go back from the river bank, rather than go above the jam. The first school in what is now the Mt. Vernon school district was conducted by Miss Ida Lanning, in a building erected by D.E. Kimble for a barn. The following year school was conducted in the new school house, the first in the valley, by G.E. Hartson. This house was made of hewed logs "pointed up" with moss. About the time Miss Lanning was endeavoring to instill wisdom in the minds of the young pioneers, Miss Zena Moores was engaged in a similar occupation in Skagit district, using the Joe Wilson cabin for a school house. This was 1871. The first church organization was established in 1871 by the Methodists with M.J. Luark, pastor, shortly followed by Rev. J.N. Dennison. The circuit comprised all the country between the British line on the north and Snohomish on the south, Snohomish, Skagit, Whatcom and Semiahmoo getting one Sunday each moth of the pastor's time. Many early settlers on the South fork of the Skagit river assembled small houseboats on which they could move when necessary. 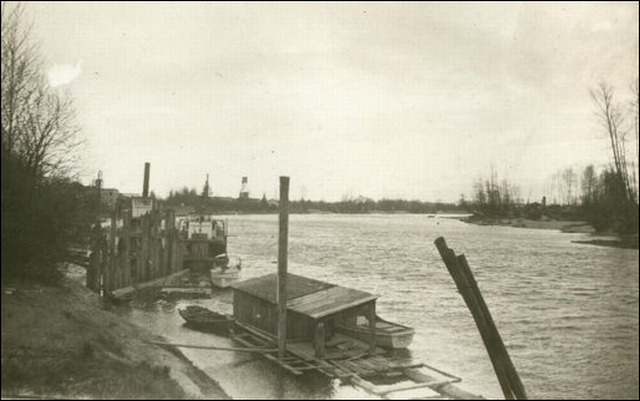 Photo courtesy John G. Kamb Jr.
At this time Skagit city was the center of trade. A union hall had been built by public subscription, and here were held all public meetings of whatsoever nature. Here were held balls, church, elections and Good Templar meetings. To all these public gatherings people still went in canoes and boats, as the trails had not yet become passable for conveyances of any kind, and in fact the only conveyance of any kind was the ox teams and sled. Horses were absolutely unknown. The young swain who wished to take his best girl to church or a ball chartered a canoe and a couple of Indians. This method though not so fast as those of the present day, was perfectly satisfactory to the young people who were pining for each others' society. Owing to a lack of tams the method of clearing land largely followed in those days was by means of "logging bees," to which the male population for miles around were invited. This custom gradually fell into disuse, as it was found that many of the men were there only for amusement and not with the idea of doing an honest day's work. Yet at that time many a poor settler would have been unable to grow the vegetables for his family but for the help of the old-time "logging bee." In conclusion, it might not be amiss to say that the old mossbacks speak of the early times as the happiest days of their lives. True they were compelled to forego many of the conveniences of modern times, but never having experienced them they did not miss them. Their plain home life was full of joys, and occasionally a sorrow when some loved relative or friend passed away. All honor to the sturdy men who have hewn out the forests of the Skagit Valley and made it to blossom as the rose. Very few are left, and these few have but a short time to stay and witness the wonderful transformation that has taken place along the banks of the beautiful Skagit. Baling Hay on Fir Island around the turn of the 20th century. Photo courtesy of Lawrence Harnden Jr.